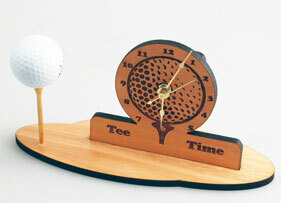 Father's Day is approaching, but this clever desk clock makes a perfect anytime-gift for the millions of golf fans out there. A clean and simple design make this project both fun and functional. Not into golf? Use the design as inspiration to create clocks with different sports themes - baseball, football, soccer - the possibilities are endless! To create this clever clock, just follow the instructions below. 14.5" x 4.5" plank of Lyptus, 1/4" thick. Available from Colorado Heirloom. Lyptus is the trade name of a wood made from a hybrid of two species of Eucalyptus tree: Eucalyptus grandis and Eucalyptus urophylla. Developed for quick harvesting, Lyptus is an environmentally-friendly alternative to traditional hardwoods. 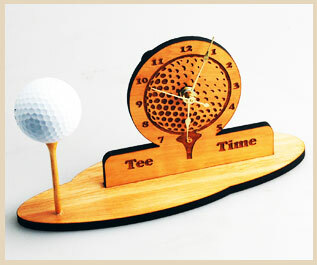 Clock works - available from craft and hobby stores, we got ours at Hobby Lobby. Make sure the dial thickness is at least 1/4" to ensure it fits through the back of the wooden cut-out. We used a 50-watt Helix with the following settings: 70% speed, 100% power for engraving and 8% speed, 100% power, 500 frequency for cutting. The first step is to engrave the golf ball and text. Let's start by inserting the plank into the upper left corner of the engraving table. Send the job to the laser using the speed and power settings recommended for your system. After the pieces have been engraved, use a damp cloth to wipe away any wood residue created during the engraving and cutting process. Now you're ready to assemble the clock. Let's start with the clock face. 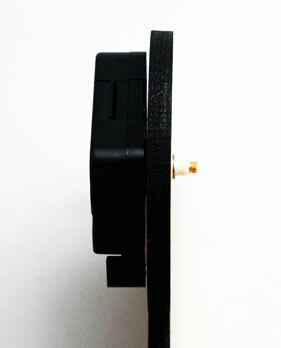 Take the clock works and insert the mechanism through the back of the clock face, as pictured to the left. 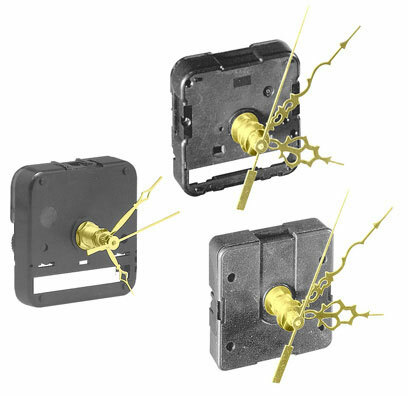 Finish assembling per the instructions that come with the clock works. While instructions may vary by brand, the directions should look similar to the graphic to your right. 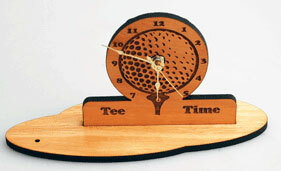 After you've assembled the clock face, insert it into the base, then glue the tee in the small hole at the front. After the glue has dried, place the golf ball on the tee. Insert the battery in the back of the clock works, set the correct time and that's all there is to it!